Cape Vista,Vacation Home, three bedroom, 2.5 bathroom gulf access property with swimming pool and spa. Cape Vista, located near Cape Harbor Marina, Rumrunners & Fathoms Restaurants. Welcome to vacation rental Cape Vista located in the SW part of Cape Coral. Cape Harbor, Rumrunners Restaurant as well as Fathoms and a few other shops within walking distance from this newly remodeled home. Villa Cape Vista features 3 bedrooms, 2.5 baths of which one serves as a pool bath-accessible from the large pool deck. Vaulted ceilings, split floor plan with an open kitchen and lots of living room space. The master bedroom with its own ensuite bathroom is located on the left side of the house while the 2 guest suites are located on the other side of the house sharing an upgraded bathroom with a tub shower. The lanai features a large under truss sitting area, intersecting canal views, southern exposure -sun all day-, as well as an electrically heated hot tub. Willkommen in der wunderschoenen Ferienvilla Cape Grande. 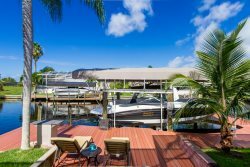 Dieses Ferienhaus befindet sich im SW von Cape Coral nur wenige Laufminuten von Cape Harbour mit Ihren wundervollen Restaurants Rumrunners, Fathoms sowie vielen kleinen Shops. Villa Cape Vista bietet 3 Schlafzimmer und 2.5 Baeder. Das halb Bad dient auch gleichzeitig als Poolbad. Hohe Decken, viel natuerliches Licht, eine offene Kueche mit hochwertigen Kuechengeraeten sowie Granite Countertops. Das Elternschlafzimmer befindet sich auf der linke Seite des Hauses waehrend die zwei Gaeste Schlafzimmer sowie ein weiteres Bad auf der anderen Seite des Hauses sind. Die Suedausrichtung des Swimming Pools bietet den ganzen Tag Sonne, der elektrisch beheizte Swimming Pool sowie Whirlpool stehen fuer Sie zur Verfuegung. Auf dem eigenen Bootsdock kann man bei einem Sundowner jederzeit die Seele baumeln lassen. This was our first stay in this beautiful property which has a casual coastal vibe. The breathtaking water views were our first delight upon entering the front door. The home is furnished comfortably and the kitchen stocked with all one needs to prepare gourmet meals at home. The beds are super comfortable! The lanai and pool deck areas are large and perfect for entertaining. We enjoyed sitting down at the dock for gorgeous sunsets and a glass of wine. Cape Harbor with its great restaurants, coffee stop, and shops is a short 20 min walk away. It was fun watching all the boats pass through the lock on their way out to the Gulf. This home is located in a quiet and friendly neighborhood. Bikes are available to use. We love the laid back atmosphere Cape Coral offers and plan to return to this property soon. We like that it is a family business....a BIG plus! We can't wait to come back here next time!